I was having a conversation with a couple of tailors and cloth merchants last week about the success of Anderson & Sheppard in recent years. People persist in saying the suits have little distinctive style of their own, but I contest that. In particular, the size of the collar sets any jacket apart and this is particularly noticeable on the double-breasteds, which is one reason I prefer them to the SBs. It does a lot to accentuate the drape in the chest, adding more to impression of volume. 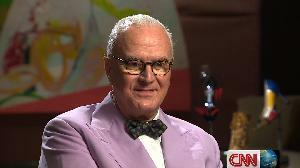 Then are men like Manolo Blahnik, seen here interviewed this week on CNN. 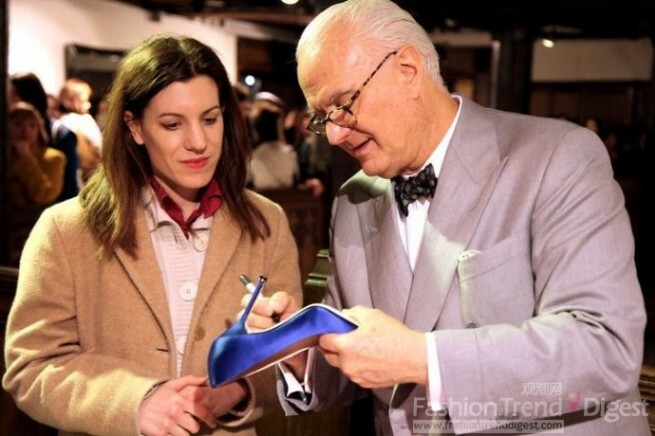 The point about the collar remains true, but Manolo adds a pink sparkle of his own, a wonderfully contrasting bow tie and some purple velvet pumps. Beautiful. You can see one of my DBs in this PEN piece. You can follow the discussion on Manolo Blahnik in Anderson & Sheppard by entering your email address in the box below. You will then receive an email every time a new comment is added. These will also contain a link to a page where you can stop the alerts, and remove all of your related data from the site.